This letter discusses the negative effects of police brutality and racism in our country. “This moment in our nation’s history is not about how individual fears are articulated — in an emergency call, in an officer’s response, in weapons drawn and fired, in black people’s desire to flee for their lives, in black parents’ anxiety about the safety of their children. This moment is about the enormous, almost invisible structure that informs those fears — the way media and cultural presentations disproportionately display black people, and black men in particular, as dangerous and menacing and criminal” (Blow). 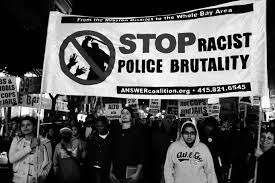 Racism and police brutality are two of the largest problems facing the United States today. And when you fuse these two problems together, the entire nation stands under a psychological state of emergency. Our nation needs to positively adjust the amount of racism, bias, and insecurity that is held deep inside of individuals. Police officers that kill innocent people should be held accountable for their unorthodox behavior and racial bias. Racial and ethnic diversity are two of the most desirable traits among American people, but lately, the amount of social and racial conflict in our country appears insurmountable. According to pewsocialtrends.org, “There are large gaps between blacks and whites in their views of race relations and racial inequality in the United States.” Black people typically have negative views on race relations, while white people share equal views. Overall, there are insecurities among each race, which has the capability to cause an uncomfortable environment among the citizens of our nation. Also, these past few years there have been too many killings of young people by authority figures. The large scale publicity started with the case of a young man, Trayvon Martin, who was murdered by George Zimmerman on February 26, 2012. The ridiculous amount of cases in our country that we see in the media have degraded the amount of social trust not only in races, but in authority figures and community members. Body cameras need to be used in order to define who was at fault, in a conflict between police officers and civilians. Laws concerning body cameras need to be changed, so that footage of conflict are allowed to be used as sufficient evidence, and released to the public. Certain states have also made laws relating to body cameras, one of which being my home state. “In the past year alone, Kansas, North Carolina and South Carolina have declared body-worn camera recordings exempt from their open-records laws, and several other states have imposed severe restrictions on public access” (Zansberg.) There were protests in Charlotte, N.C., due to the government not releasing body camera footage, as well as the hurt that the large city felt after the loss of an appreciated community member. Also, authority figures have taken the lives of too many innocent people, both black and white. Since January of 2015, police have killed 42 young (18-29) black and white unarmed males. Among these people, 24 were black, and 18 were white. Ultimately, we need to decide if we are giving authority figures too much power over our country. Some people may believe that police officers have enough authority to take innocent lives; they believe that officers must protect themselves, but is that the truth? The answer is no. In this letter, I am not focusing on the people that are armed and a serious threat to officers, but I am concerned about unarmed civilians. Many of the publicized stories do not involve victims who are armed, but people who do not pose an immediate threat to the present officers. People who have done nothing wrong should not be forced to leave their families and friends, forever. There are specific measures that need to be taken in order to improve the wellbeing and safety of the young citizens in the United States. Racial diversity should be implemented throughout the police departments in our country. Police officers absolutely have to push for more diversity amongst their team. Also, departments should reach out to minorities, in order to increase racial and ethnic differences throughout the workplace. Police officers, as well as other government officials, should get to know their community. National programs should be implemented in order to allow officers and troopers interact with the people of their community. An officer should have to live in a certain area for a number of years, before receiving full responsibilities as a sheriff’s deputy or state trooper. These are all solutions that could positively impact the conflict at hand. Dr. Martin Luther King Jr. said, “Darkness cannot drive out darkness; only light can do that. Hate cannot drive out hate; only love can do that” (Brainyquote) The United States has to stop encouraging racism, and demoting love. We must learn that no innocent life is okay to take, especially by figures that we are taught to trust and respect. It is your duty as the next president to solve this problem, and save my life. Blow, Charles M. “Police Violence: American Epidemic, American Consent.” The New York TImes, The New York Times Company, 26 Sept. 2016, http://www.nytimes.com/2016/09/26/opinion/police-violence-american-epidemic-american-consent.html?rref=opinion&module=ribbon&version=context&region=header&action=click&contentcollection=opinion&pgtype=blogs&_r=0. Lowrey, Wesley. “ Aren’t More White People than Black People Killed by Police? Yes, but No.” The Washington Post, The Washington Post , 11 July 2016, https://www.washingtonpost.com/news/post-nation/wp/2016/07/11/arent-more-white-people-than-black-people-killed-by-police-yes-but-no/?utm_term=.d61714d7c163. Wormald, Benjamin. “How Blacks and Whites View the State of Race in America.” Pew Research Centers Social Demographic Trends Project RSS, Pew Research Center, 24 June 2016, http://www.pewsocialtrends.org/interactives/state-of-race-in-america/. Zansberg, Steven D. “Why We Shouldn't Hide What Police Body Cameras Show.” Why We Shouldn't Hide What Police Body Cameras Show, Governing, 29 Aug. 2016, http://www.governing.com/gov-institute/voices/col-police-body-camera-recordings-transparency.html. This letter talks about our education system, and what we can do to make things better. In order to protect the people and their children, more gun regulations need to be enacted. This letter asks what will be done about gun laws and shows argumentative points to both sides. Racism has been an issue for a while and it needs some addressing as well as minor adjustments. Police brutality has become a major issue all around the U.S many things need to happen in order for it to stop.